Rock legend Jim Morrison has been enlisted to help fight global warming more than 35 years after his death. Woman in the Window, a previously unreleased poem written and recorded by The Doors frontman shortly before he died in 1971, has been set to music. The single will be used to publicise the Global Cool campaign, which is aiming to cut carbon emissions. 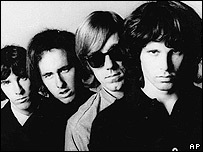 The recording, which describes an angel warning humanity about its actions, was released by the Jim Morrison estate. The song has been produced by Perry Farrell, former singer with grunge band Jane's Addiction. It will be released as a single in April. The London launch of the 10-year Global Cool campaign was attended by singer KT Tunstall and Hollywood actor Josh Hartnett. The campaign is asking a billion people to reduce carbon emissions by one tonne a year each, mostly by small changes such as using energy-saving light bulbs and switching off electrical devices. According to Global Cool, this action will buy enough time to develop cleaner renewable energy sources.